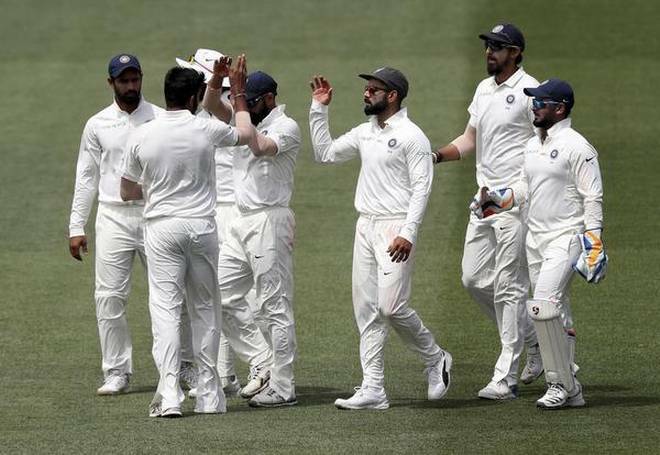 India gave wings to their ferocious ambition of winning a maiden series Down Under, beating Australia by 31 runs in the opening Test with an irresistible fusion of self-belief, hunger and talent here Monday. Indian players celebrate the dismissal of Australia’s Pat Cummins of the final day of the first cricket test between Australia and India in Adelaide, Australia,Monday, Dec. 10, 2018. This is India’s first series-opening win on Australian soil since 2008. Rishabh Pant finished with 11 catches, and equalled the record for most dismissals in a Test by a wicketkeeper, sharing it with England’s Jack Russell and South Africa’s AB de Villiers.